I think after the summer transfer window, even the most pessimistic town fans (and there’s plenty) were looking forward to an exciting season filled with ‘full throttle’ and ‘no limits’ football. But what has unfolded over the last 44 championship games is surely beyond the expectations of most. 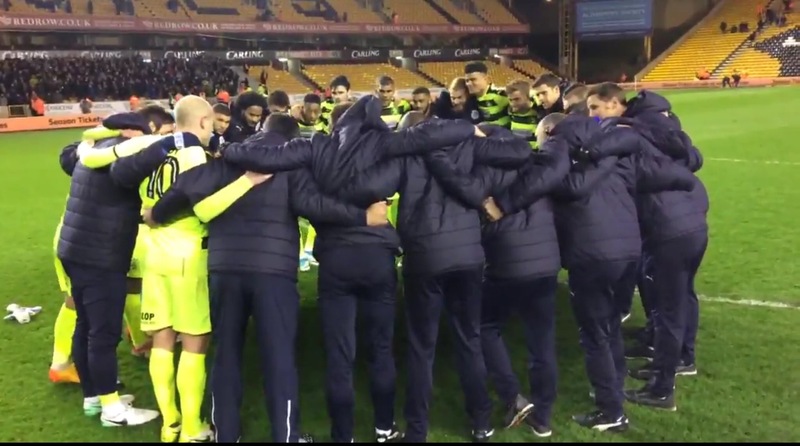 After a 1-0 win at Molineux on Tuesday night, Town mathematically secured their play-off spot, meaning that Wagners men are effectively three games away from the top flight. Who would’ve thought that would be the case for the same club that Chris Powell so often claimed “couldn’t compete”. When David Wagner arrived at Huddersfield Town some 16 months ago now, he came with refound belief that this club could challenge with the best in the division. He led the side to comfortable survival last season, and despite a late slump in form, the attentions were completely focussed upon a successful 2016/17 campaign. Dean Hoyle backed the manager with funds in the transfer window, and there was a significant squad overhaul, with 13 new signings and 10 departures. Of these new signings, six were from overseas, showing Wagners range of contacts within the footballing world, and Town’s commitment to ‘doing things differently’. The build up to the season was met with optimism from the fans, and a general feeling that Town could slip under the radar and challenge towards the upper end of the table. What followed was extraordinary. After 11 Championship matches, Town sat clear at the top of the league, having won 8, drawn 1 and lost 2. This included a win at St James’ Park. A stumble following this period meant that heading into December Town’s playoff status looked precarious. However a remarkable run of form which saw just 3 defeats in 21 league and cup games (WWWWDWWLWWWWWWDWDLLWW) propelled Town into serious automatic promotion contention. The January transfer window also saw Town strengthen further, with both Izzy Brown and Collin Quaner joining the club. An FA Cup run saw Town score 4 goals in both rounds 3 and 4, and the Terriers held Man City to a 0-0 draw at the John Smith’s Stadium. The replay unfortunately saw Town fall short in front of over 7000 travelling fans. A tricky spell towards the latter stages of Town’s season has seen them miss out on automatic promotion, however being the first side to secure the play offs allows Wagner to prepare earlier for the 2 (hopefully 3) ‘lottery matches’. Whatever happens in the play offs, all Town fans will agree that this season has been a joy to behold and the credit for that stretches not only to Wagner and Hoyle, but also to the fans for their incredible support all season long. Now let’s win those play offs! Next The greatest day of our lives – Huddersfield Town are in the Premier League!